Japan's population continues to diminish due to the falling birthrate even as our society ages at a globally unprecedented pace. To survive this difficult era of changes while continuing our corporate social contributions through growth, Nippon Signal established "Vision-2020 3E," a 12-year, long-term management plan launched in 2009, unfolding our vision of the Nippon Signal Group in 2020 and the path toward achieving these goals. 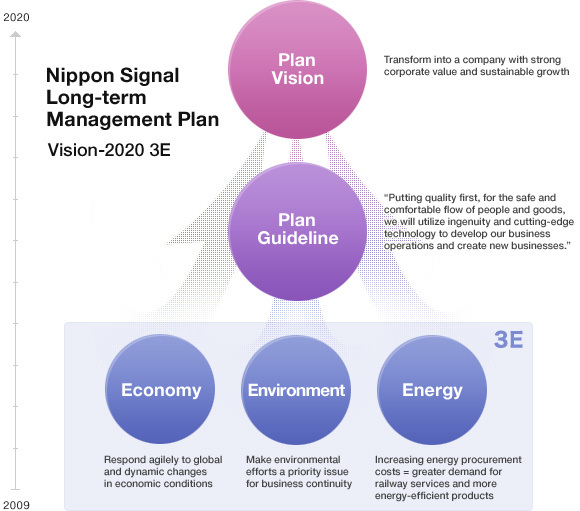 Vision-2020 3E details Nippon Signal's path to sustainable growth as well as a system facilitating employee job motivation based on dreams and hopes for the future.